The council yesterday did the thinkable and voted to future proof the City Rail Link for 9-car trains and the Karangahape Rd for the Beresford Square entrance. Then, in a joint press release Transport Minister Phil Twyford announced the government agreed with it too after cabinet agreed to it yesterday. Basic future proofing for about $100 million that would make the station boxes big enough, but fitting them out for longer platforms and access would need to occur later and likely at a higher cost than doing it now. Building and fitting out the stations so they’re available for day one, even though we might not see a 9-car train for a further decade. This would obviously cost more but we don’t know just how much more. Unfortunately, we won’t find out exactly which option we’ll get till sometime in the future, likely after the tenders have been completed. Much of the discussion about the CRL this week has focused on how this will the increase of capacity from 36k to 54k per hour. This got me thinking about just how much we’ll be adding in the coming decades. So I thought I’d try and highlight it. First, some background to the numbers used in this post. Light Rail – I’ve assumed a capacity of 450 people per service and that the two routes (Dominion Rd and SH16) would each run at frequencies of every five minutes, combining together to double capacity in the heart of the city. I’ve also assumed that both lines would carry on over to the North Shore, like our Congestion Free Network. Bus – There are four key routes that will see buses enter the city, Fanshawe St (there will still be the Onewa Rd buses from the Shore), Victoria St West, Karangahape Rd and Symonds St. Bus lanes can generally carry about 100 buses an hour before becoming overloaded and I’ve assumed that all buses will be double deckers carrying up to 90 people. Ferry – I’ve assumed that each of the current routes will have at least two services and hour (4 per hour for Devonport) and be plied by vessels capable of holding 400 people. Car – The number of people arriving in the city centre by car has been dropping for many years now I’ve assumed that current capacity to enter the city will be as road space is reallocated to initiatives like Light Rail and improved walking and cycling. Walking and Cycling – We know that walking and cycling are some of the most efficient ways to get around. I’ve looked at how many pedestrian crossings there are over the motorway and assumed about 9,000 people per hour could cross it. This goes off the chart and makes it difficult to see the rest of the modes, so I’ve capped the graph at 60k. 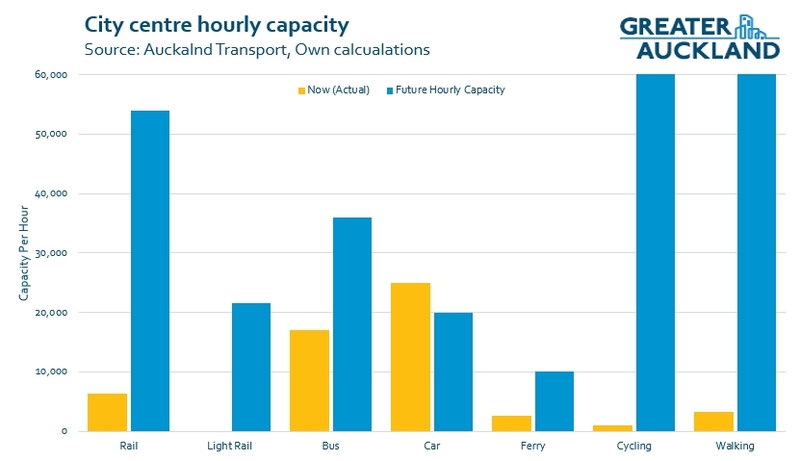 There are some big increases in there and would deliver Auckland enough capacity to move everyone who currently arrives in the two-hour AM peak, in one hour on PT alone. Matt, is the number of people arriving by car actually decreasing, or is it staying steady against rising PT ridership and therefore the percentage is decreasing? Currently, or rather recently, it’s flat to a slight decline. All other modes have been booming (except ferry), including, and this gets overlooked, numbers of new local residents: already being there beats getting there. Or, to express this in strictly movement terms, people walking or riding but who aren’t commuting to the city, but within it, are also increasing…not crossing a motorway or the harbour. I wonder how much of the increase in cycling and walking capacity numbers require some road reallocation in the suburbs to enable it? For these more space-efficient modes to increase like this, surely there will be some traffic evaporation in the suburbs meaning the cars coming into the cbd will naturally go down? As an example, I realise Skypath contributes to the numbers, but then there are all the routes leading to Skypath to consider. Their amenity and safety needs vast improvement. In theory, yes. In practice, a car is not only a means of transport to get from A to B, but also your protection suit against the environment on the way. A bicycle does not work well as a protection suit. On the other hand SUVs are even better, which is why they’re displacing regular cars. hence the suggestion to reallocate road space so that cyclists do not need a protection suit. I know that suggestion. But then protest happens and proposals go to waste. For instance, did someone mentioned a network of safe streets around Skypath? That is a good idea, but unfortunately that vision has died in Northcote Point last year. There’s no sensible way to cycle to Skypath if you can’t cycle on Queen Street. You are assuming that just because AT watered down Q Street bikeways in response to some grumpy locals, this is what it will stay at. AT is (slowly) changing. The Shore’s residential attitudes re bikes will change a lot faster once SkyPath opens – and in any case, even back in 2014, the support for SkyPath – even right in Northcote point – significantly outweighed opposition. Once it is there, even many of the sceptics will embrace it, and call for change. Do we know how many people live in the city and commute out to other parts of the city? The counter-peak flow on the NEX and the Northern Motorway seems to be increasing. For instance, there also seems to be a decent number of Westlake Girls and Boys students who take the NEX from the city. We know that about 50,000 people live in the city centre. We also know how many people take PT out of the City Centre each morning (about 7,000). But we don’t know that the people leaving the City Centre by PT actually live there, or if they are transferring from other suburbs via the city centre. Presumably both to some degree. 1)Adding ~20k to the hourly capacity of the rail route is sufficient to completely replace the entire current driving modeshare (roughly 50/50 between m’way and general roads). 2) of course rail doesn’t reach everywhere, or suit every need. But then there are additional surface capacity increases also coming reaching other directions and users: Light Rail, cycling (esp SkyPath), buses, ferries, walking and city living. 3) This means there is a huge opportunity to repurpose city centre road space to other modes/uses. We should now be planning how to order delivery and service access, and exactly how few general traffic vehicles we are happy to host there, ie how far above zero is ideal? Tricky issues here are; universal access, taxi-type services, access to private in building parking…. It is fantastic that the CRL has increased its capacity. Will the rest of the network cope with the increase? I’ve been moved onto a bus when there’s been a track fault, but what does a track fault mean for 56,000 people per hour? A good argument for why we also need good bus corridors, busways, light rail, ferries, bikes and feets. There is a clear tension between making the most out of an investment, and having resilience. A good train operating plan that can isolate faults and keep the rest of the network running would be a great start. Also we are probably getting to the scale where we need a standby fleet of replacement buses as a flying squad ready to intervene where an when necessary. Be that replacing a train line due to fault, shuttling between mt eden and Britomart if there is a fault in the CRL, picking up demand for a big event, or replacing ferries during the occasional king tide. Maybe Auckland should use buses to overcome major breakdowns on the motorway? Have a dozen ready to deploy on parallel routes at first notice of a disruption. Yes, I’ve often pointed out that the buzz around resiliency is good, but that people don’t seem to understand that it means the opposite to efficiency, and we need to accept this as OK.
There’s resiliency, I guess, in a bus lane that is not full to capacity with buses, because the timetable keeps that space available for emergency situations. Whereas a motorway general traffic lane is not constrained by a timetable, and therefore being under capacity provides no resiliency; it just fills up. It is not just the ‘spare’ buses, but a place to store them, and importantly people to drive them (on fairly short notice). As the last is a challenge for current bus numbers, this will require an increase in pay rates across all drivers, adding to the cost of this worthwhile proposal. As Nick says below but don’t forget the basic fact that the CRL itself will add resilience by there been two “tracks” into the CBD compared to the current one into Britomart. Better word would be two “paths”. That the council then the government agreed in quick succession on such a major costly addition to the CRL project, in this country in 2018, is just light years being where we were just a short time ago. Yes, it’s good to remember this; how far we’ve come, how we aren’t going back. Good work everyone here, among others. Take a bow. Absolutely. I regard the start of the Inner Link in Feb 1997 as the start of the turnaround of Auckland PT. Since then there have been so many significant improvements and developments that it’s hard to keep count. But because it happens only incrementally, there are still a lot of non-PT users who believe that the system is still unusable. And of course there’s still a loooong way to go before Auckland can claim a real PT “network” – but the completion of the busway and light rail developments already flagged will bring us closer than we may think. For many motorists, I’m sure it’s a matter of looking for an excuse NOT to use PT, and general (and possibly wilful) ignorance of the changes that have been made in these last 20 years. As an aside, I recently attended a meeting of motorists affected by the Manukau-Papakura motorway upgrade works, and I was surprised to find that many accept that we cannot build our way out of congestion, and that the real answer is for much better PT (so that other people will move to PT and leave the motorway clearer for themselves, I suspect). Having said that, the same people were almost 100% negative on the cycle/walking path being constructed alongside the motorway, so still some way to go with the unreconstructed motorist. David, I had the misfortune to use that bus (and the Outer link) when I worked in Parnell a couple of years ago .If that is the standard for the city then just how lucky are we on the Shore with the bus way? At the end of the day it moves at snail like pace into the city because of the absence of bus lanes. It is long overdue for AT to assert some leadership and make the city PT experience better. Of course the issue is, as was discussed right at the start of the thread, that city streets are carrying and need to have the capacity for almost the same number of cars as they always have. Or do they need to have the capacity? Arguably as Matt suggests we should be making more space to facilitate the more efficient, more congestion avoiding, and more environmentally friendly PT options. On the other side of the coin it is a more difficult argument for the Queen St financier, or the Shortland St lawyer to maintain that they absolutely need to drive to the city. Don’t get me wrong, I don’t have a problem with people driving, but I do if it is clogging the way of PT options. Roll on a city congestion charge or parking tax to free our city streets. Let’s hope the unthinkable is also unsinkable – should the wrong politicians come back to power. I think Simon Bridges knows that National needs to embrace carbon zero (after all Paula Bennett was the one who signed up to it) but he just doesn’t know how to get there. In two years from now it will be very hard to unwind what has happened before. I don’t know why climate change is a news story every night on the conservative TV1, but it is. The story tonight about the heating over so much of Europe is sobering, if not frightening. All of this is happening and yet NZ as a whole has barely started a formal conversation on carbon zero which will come with the Bill later this year. Possibly this story has already gained a momentum that is already irreversible?